Evil AntiMatter is holding your agent leader Solomon Blaze captive in the prison pod at his huge Portal Hideout, and is threatening to send him through the portal. Launch a rescue mission in the Agents’ speedboat, steering clear of the robot shark Sharkanator’s snapping jaws. Lego Galaxy Squad Star Slicer #70703, Retired. We try our best to be as accurate and thorough as possible. 99% Complete. Pieces are in Clean and in Very Good Condition. #11598 - Trans-Purple Container, Faceted 4x4x3,Alien Pod Section (2). New LEGO 70165 Ultra Agents Mission Headquarters 1060 pcs. 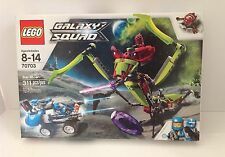 LEGO 70709 Galaxy Squad Galactic Titan Factory Sealed Brand New In Box Retired!! LEGO 70709 Galaxy Squad Galactic Titan. • Deep space destroyer features removable, detailed cockpit, rotating wings and wing-mounted flick missiles. Factory Sealed. • Rescue blue team pilot Max Solarflare from the cocoon prison! LEGO 70703 GALAXY SQUAD STAR SLICER. Stop the Alien Star Slicer with the Blue Team heroes. Make Solomon Blaze’s vehicle into an armored car and agile flyer to dodge the Star Slicer’s stinging claws!